YOU GUYSSSSSS. These no bake nut butter bars SAVE me on mornings I don’t have my act together. Which is basically every morning right now, since pregnancy insomnia has been keeping me up from about 2:30 to 5:30 am. It’s the weirdest thing. It doesn’t matter what time I go to bed. I routinely just wake up around 2:30 or 3 and then am WIDE AWAKE for 2 to 3 hours. It’s not my favorite. So having breakfast for my son already made is a HUGE help on zombie mornings. One of my favorite tricks for keeping healthy breakfast and snack options on hand is to make things in big batches and then freeze them. It’s just as easy to reach into the freezer as it is to pull a package of something out of the pantry. 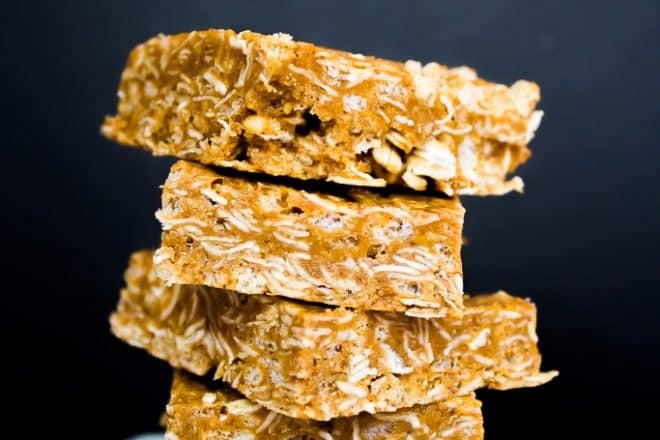 I first started making no-bake peanut butter bars for my toddler when I was busy with school and had to pack his breakfast to go to daycare in the morning. But, the recipe I started out using had a TON of ingredients in it. I decided to simplify things a bit with my own 5 ingredient version. They keep best in the freezer, and are ready to eat after a quick 10-15 seconds in the microwave, or by sitting out on the counter for a few minutes. They just need to soften up a little bit from frozen so you can easily bite into them. You can slice the bars whatever size you like. Typically, I make some that are slightly bigger, for breakfasts, and then do some that are about half the size for snacks. I keep them in a big bag in the freezer with a little parchment paper, but they usually don’t stick together at all. And, you can make these with whatever nut butter you have on hand. I have used peanut butter, almond butter, sunflower seed butter, and cashew butter. They’re all delicious! I use some Grape Nuts because they are low in sugar, high in fiber, and very crunchy. Rice Krispies are also low in sugar and add to the crispy crunchy texture. If you don’t have Grape Nuts or don’t want to buy them, just replace them in the recipe with an equal amount of oats or Rice Krispies. These bars are pretty energy and calorie dense, so a small bar goes a long way. I love that for busy little kids who rather be playing than sitting down for a big meal. A couple bites and you know they are getting enough to eat! 5 ingredient no bake bars perfect for kids and snacking on-the-go. More protein and fiber than packaged granola bars to help keep your kids full! Line 9x9 pan with parchment paper or spray well with nonstick spray. Add nut butter and honey to microwave safe bowl. Heat for 1-2 minutes or until melted. Stir well. Dump in all dry ingredients and stir well. Pour into prepared pan. Refrigerate 1-2 hours or until set. Remove and slice bars. Store in ziploc freezer bag in the freezer. To serve from freezer- set bar out at room temperature for 15 minutes, or microwave for 10-20 seconds to soften. This can help Chris with the family he feeds. Sounds so easy!